Well, here's our story. For the last 25 years we've lived in South Lake Tahoe, CA. 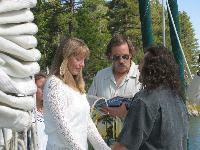 We've been together for 15 years and last year (06) we finally got married (see the picture below that made Latitude 38 ). While in Lake Tahoe Laura was an accomplished photographer. Her business did extremely well and then she sold it in 2005. I was a successful videographer and had a thriving business which won me 12 national awards including a Telly . I also sold my business in 2005. For one year after, I worked in a local TV station writing, shooting, editing, directing, and producing local television. 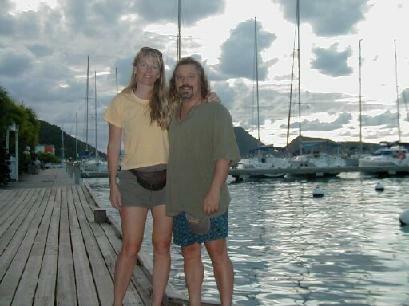 In 1999 Laura and I went on a sail trip to the Windward Islands with our good friends Gary and Becky Bell. It was on that trip we decided this was what we wanted to do for the rest of our lives. When we got home we found a little Catalina 22 and with the help of our dear friend Ed Dilley we launched her into Lake Tahoe. Gary and Becky ended up becoming our mentors and with their help and the help of some other friends we learned to sail. In 2001 a couple of other friends of ours, Steve Ott and Doyle Harris, found out about a Cheoy lee in a repo sale. Long story short, we picked it up for $2500. The deal of the century. It was our first real ocean going sailboat. "China girl" was what we called her. 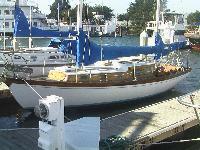 She is a Cheoy Lee Bermuda 30 ketch that we berthed in Berkeley CA. and sailed all over the San Francisco bay. She is a sweet little boat and we loved her. Steve also became a great sailing teacher for us. In 2000 we made a 5 year plan to take off. We had to save money, sell our businesses and get a boat. Whew! Well it all started to fall into place. We got China Girl in 2001 and we started to save almost every dime we could. When 2005 rolled around we still needed to do work to China Girl to get her ready and our beloved German Shepard "Sierra" was still around. So we waited. Sierra was old but we wanted to give as long as she needed and in April 06 she passed on. We will miss her. In May of 2006 our friend Steve Ott bought a catamaran in the Caribbean and needed help bringing "Solmate" to the west coast of the states. We ended up signing on for the rough leg from Costa Rico to Baja. As it turned out he was too late to get through the canal so we went to Panama and sailed the San Blas Islands (see Panama 06). It was in Panama that we decided we wanted a little bigger boat with a little more room down below and a little less teak, so within 3 days of us getting back we found Hanali and fell in love with her and her lines and bought her (another good deal). In July we put China Girl up for sale an sold her (What's up with that?) and now we're getting Hanali ready for an October departure from San Diego to Mexico.